“I don’t remember a time in my life when I haven’t known God lives,” says Elder Robert F. Orton of Salt Lake City. That testimony has been strengthened through years of scripture study﻿—much of it undertaken at night when he is unable to sleep. “When I wake up, instead of lying there I study the scriptures,” he says. He feels this intense personal study will be a benefit in his new call to the Second Quorum of the Seventy. Another profound influence in Elder Orton’s life was his grandmother Mildred Riggs, who lived with the family after the death of her husband. She set an example of personal righteousness and self-discipline, reading the scriptures faithfully every day and choosing to serve a mission while in her late 60s. “When the time came for me to consider going on a mission, I began to think of my grandmother and the kind of person she had been,” Elder Orton recalls. “Finally I said to myself, If Grandma Riggs can do it, you can do it, and you should do it.” Elder Orton subsequently served in the French Mission, an experience he credits with deepening his love for the restored gospel. 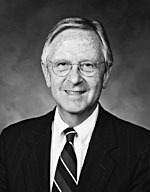 Elder Orton earned a bachelor’s degree at Brigham Young University and a law degree at the University of Utah. On 13 June 1963 he married Joy Dahlberg in the Salt Lake Temple, and they now have six children and nine grandchildren. Elder Orton’s numerous callings include service as a bishop, counselor in a stake presidency, and mission president.